Whistler continues to impress me with their continued offerings of budget-valued radar detectors that offer subtly powerful capabilities beyond what their price points would otherwise suggest and without over-the-top marketing promotions. The Whistler CR90 along with its little brother the Whistler CR85 is no exception each available at less than $180 and $150, respectively. Like their predecessors, the Whistler Pro-78SE/XTR-690SE, the Whistler CR90 and CR85 sport a large non-reflective aquamarine-colored OLED display that is readable in all lighting conditions and is accompanied with voice alert augmentation identifying detected bands. Whistlers have the unique ability of displaying GPS time–something more useful to read than merely the sensitivity setting as is typical of other radar detectors. Both models are attractive and have a low-reflectance black plastic chassis. My early production model’s power cord had a tendency to come apart but I understand later models come with ones that do not. The Whistler CR90 represents Whistler’s first GPS-enabled windshield-mount radar detector which provides a national database of red light camera and speed photo enforcement locations. The Verilight™ database is frequently updated and can be easily downloaded to your detector using the USB cable that is provided and an Internet connected PC. Unlike the Whistler Pro-3600 which required a USB-key drive to update, the CR90 can be updated using Whistler Database Update Tools that is downloadable from their website. Getting the program to work requires removing the file extension of .htm to execute. But once that is done, the program can be run directly without having to be installed like most other Windows applications. 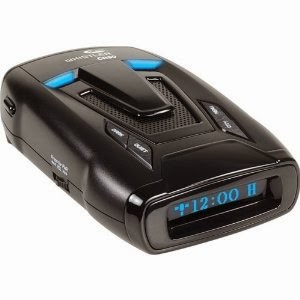 To reduce the likelihood of alerting to data points that are not associated with your route, the Whistler CR90 allows you the distinct ability to reduce the GPS alerting radius to essentially eliminate GPS alerts when driving on an adjacent highway or road–something that can occur on all other GPS enabled radar detectors. While one can mark locations of known speed trap locations (such as VASCAR), the Whistler does not allow for GPS-lockout (auto muting) of stationery radar sources like those emanating from door openers or drone signs. Reception to Ka-band continues to be exceptional and while X-band and K-band detections tend to lag somewhat as do off-axis detections–relative to other manufacturers higher-end models (costing twice as much or more)–they should be sufficient for most drivers. Like previous models, the Whistler CR90 can display Ka-band frequencies of police radar at 33.8Ghz, 34.7Ghz, and 35.5Ghz to allow the driver to instantly differentiate a legitimate Ka speed trap from a Ka-false occurring at another Ka frequency that can occur when in close proximity to another radar detector in another vehicle. Laser sensitivity is also very good and is better than windshield mount detectors of other manufacturers that cost nearly three times as much. Since Whistler also caters to an international clientele, their detectors can alert to difficult-to-detect police laser guns used both abroad and in the U.S. that other detectors simply can not. These models include the LTI TruSpeed S, Laser Ally &amp; Dragoneye, Laser Atlanta Stealth Mode, and the Laser Atlanta Torch w/Stealth Mode II. Their increased sensitivities to laser also makes the CR90 and CR85 (non GPS model) more likely to alert to lidar-based vehicle accident avoidance systems such as those by Toyota and Infiniti. Fortunately, these systems are readily identifiable because Whistler also has the unique ability to determine and display laser pulse rates along with their laser detections, which allows for locking them out at a push of a button. As Whistler’s engineering identifies more of these newer systems, future firmware versions will have these these pulse rates already locked out by default. Without question the most menacing new development on the roads is the explosive use of vehicle K-band lane departure systems. These rolling sources of RF interference often wreak havoc on radar detectors and the CR90/CR85 are by far the most adept at filtering these obnoxious systems in a manner that has the least adverse impact on K-band reception. Unlike other radar detectors which can add a second or two delay to alerting to K-band detections to reduce false alerts from these types of systems (and with only modest results), the Whistlers allow for incremental timing delays that were effective in eliminating the systems I encountered. Whistler also uses a similarly configurable feature (TFSR) to effectively filter out stationery K-band and X-band traffic flow sensors that can be found on certain highways throughout North America. Whistler has for a long time valued the importance of having quick reacting detectors which can allow them to alert sooner to an approaching radar trap than slower and more sensitive ones. But for the first time, these new Whistlers also have the unique ability to have their reactivity to Ka-band manually adjusted in fine increments to further reduce Ka-falsing, while maintaining their high sensitivity, independently of the X or K band. Whistlers are the only ones ever made that allow savvy owners the ability to directly alter the reactivity (speed) of detections. This is especially useful because I prefer a detector, even potentially a less sensitive one, that can alert to brief appearances of police radar–such as those from instant-on or quick-triggered radar–than a more sensitive one that is intentionally slowed that may not. This makes the CR90 and CR85 very special, indeed. The CR90/CR85 both continue to provide the best city modes available on any detector. When CITY mode is selected, sensitivity is unchanged from HIGHWAY mode, but the alerting tones to X and K sources are more mild and brief. CITY 1 and CITY 2 modes increasingly reduce sensitivity for driving in an area that has a lot of stationery sources of radar falses, such as door openers. These configurations and the fact that the Whistlers don’t alert to extreme off-axis detections also makes them well suited for driving around town. With respect to product packaging, I feel it is high time for Whistler to provide a nice carrying case. In my opinion, these detectors are too nice not the provide their owners a safe way of storing them or taking them along to the airport. In conclusion, I found the CR90 to be an absolute pleasure to drive with, allowing for eminently usable configurations simply not possible with any other radar detectors. The CR90 and CR85 are without question the best values currently on the market. Either one should definitely be on your short list.